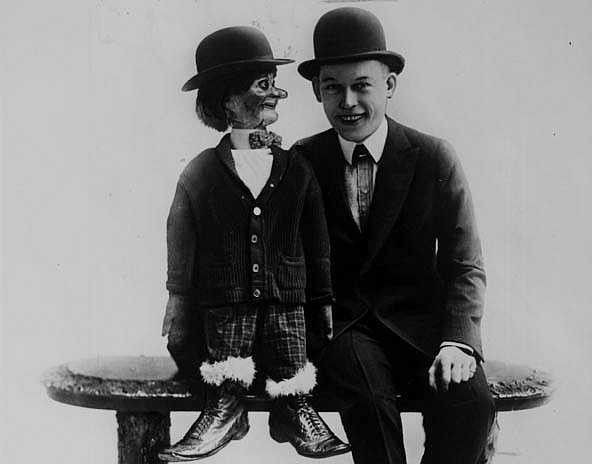 Fred Allen with dummy, circa 1916. Image courtesy of Wikimedia Commons. In his 45 years of trying to make the world laugh, about 25 of which he spent succeeding, the writer-comedian with the bellhop eyes (“they carry up to four bags”) covered the country but never really settled down. He never owned a house or a car because “they make me nervous,” but he “dwelt” in many places. . . . He spent years in Hollywood making pictures, but he spoke of California thus: “The climate is fine. If you’re an orange, it’s ideal.” . . .
Just prior to his death in 1956, he had been working on Much Ado About Me, a memoir covering the two decades of his career as a stage performer, before his transition to radio during the early years of the Depression. The nearly completed manuscript (which ends in the year 1928) was rushed to press after his death and includes the following selection, which recalls the glory days of vaudeville. Notes: Most of Allen’s vaudevillian allusions are clear from context. Among the more obscure references: Kimberley is the capital of South Africa’s Northern Cape Province, an area noted for its history of diamond mining; thus, Kimberley gravel (page 568). The comedy duo Olsen and Johnson (p. 577) were John “Ole” Olsen and Harold “Chic” Johnson; their heyday occurred during the waning years of the Depression, when their Broadway show Hellzapoppin' ran for 1,404 performances. Gus Sun (p. 581) was the pseudonym of former circus juggler Gustave Klotz, who became a booking agent for minor vaudeville acts. Vaudeville is dead. The acrobats, the animal acts, the dancers, the singers, and the old-time comedians have taken their final bows and disappeared into the wings of obscurity. For fifty years—from 1875 to 1925—vaudeville was the popular entertainment of the masses. . . . If you don't see the full selection below, click here (PDF) or click here (Google Docs) to read it—free! A very interesting, nostalgic and reminiscent writing. It is a kind of tribute to people of Fred Allen' s ilk. It is unfortunate that this genre of people, any where in the world were ill treated and looked down as second class citizens. But what is astounding is that the artists small or big, not - so - talented or talented ignored their troubles and travails , persevered and entertained the public.